Whether you’re looking for a nice pair of dress shoes or a comfortable pair of work boots, the locally-owned shoe stores of Nebraska have you covered. At these shops, you can browse all of the top brands. Plus, the helpful staff will provide attentive service you just won’t find anywhere else. Here are our favorites. Tufly’s Shoe Center is a family-run business that offers custom, comfortable solutions for all of your footwear needs. Whether you have medical issues or hard-to-fit feet, Tufly’s can help get you in the right pair of shoes with ease. For standout styles, look no further than Pattino Shoe Boutique. Nestled in the College View Shopping District in Lincoln, Pattino Shoe Boutique is a charming local shoe and accessories store that has quickly become the city’s premier spot for beautiful and unique footwear. Haney Shoes has been providing Nebraska with personalized, friendly shoe services for more than 75 years. 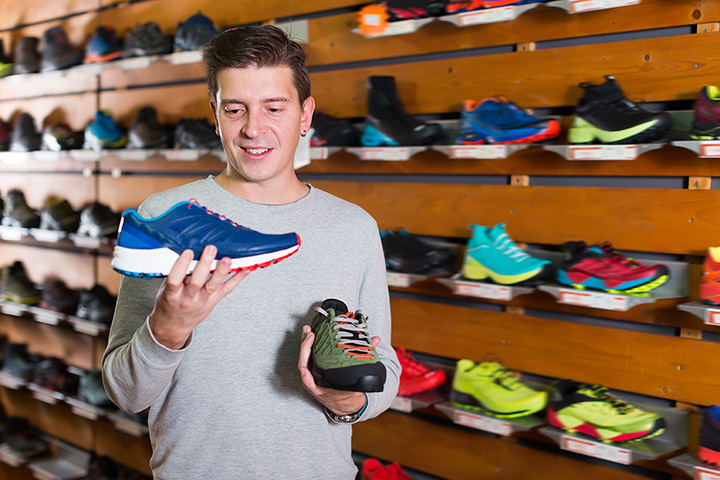 This family-owned store offers a variety of safety and casual shoe styles in hard-to-find sizes. Buck’s Shoes is a friendly local shoe store that carries quality shoes, accessories, and more for men and women. As a recent winner of “Best Omaha Shoe Store,” if you’re looking for a new pair of shoes that are certain to turn heads, then this is your place. Since 1975, Footloose & Fancy has been Lincoln’s premier Birkenstock retailer and top shoe stores for friendly, personalized service. In 2012, outdoor and lifestyle apparel was introduced to the shop with a focus on environmentally-friendly lines and the “do good, be good” philosophy. Since 1994, Peak Performance has provided runners and walkers in Omaha with all of their footwear needs. Expanding to four stores in the Omaha area, Peak Performance is the number one spot for any running shoe needs. For durable footwear options, make your way to Industrial Outfitters in Grand Island. This local, second generation shop has everything you need to get the job done carrying name brands such as Red Wing, Carhartt, Wolverine and more. Founded in 1984, the Sporting Edge shoe store is a favorite among athletes with over 500 styles of shoes to choose from. At Sporting Edge, athletes can find the hottest brands, including Adidas, Converse, Under Armour, Nike, and many more. For over 80 years, Redman’s Shoes and Ranchwear has been a destination for top-of-the-line shoes, boots, and apparel. This family-owned shoe store stocks dozens of brands.